This research developed as a result of many hours sitting and working in cafes, in many different countries as I continued with my research activities. Having spent so much time in cafes I often thought that they would be an interesting phenomenon to research in terms of how people use them, how the businesses develop and the different cafe cultures that are present around the world. Over the years I had begun to collect pieces of information and documents about cafes and finally decided to put a project together which was funded by Coventry University - 'Spaces of Community' - outlined below. This has developed into a broader research agenda around a number of different areas in the coffee and coffee shop industries. The aim of the study is to explore the development of the café industry, and understand the role of different types of cafés in a range of urban spaces. Specifically the study seeks to examine not only the economic impact of the cafe industry, but the importance of cafés for different communities and cultures and how the industry is changing. How and why the cafe industry is developing? What roles cafés play in communities? You can find out more about this research on the blog Cafe Spaces. Ferreira, J. (2017) Has the UK reached peak coffee shop? The Conversation 23/11/2017. This research was featured in Coventry University's Innovate Magazine in January 2018. On the need to continue discussions of waste: Government responds to 'latte levy' proposal. 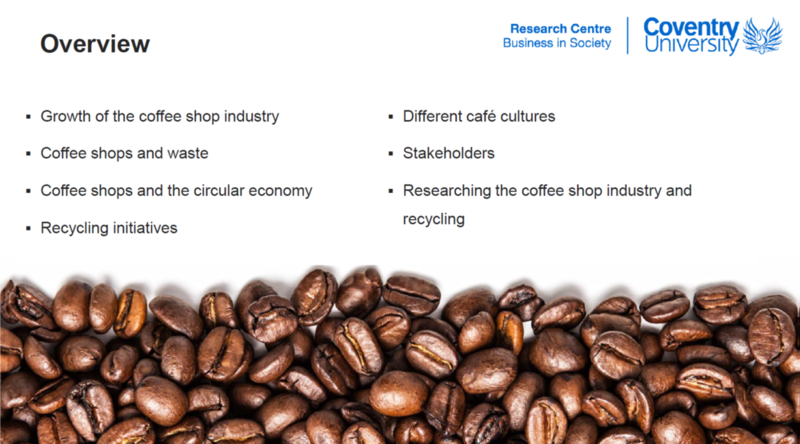 'The Coffeeshop Industry, Recycling and the Circular Economy', Leiden University, Netherlands. February 2018. ‘Beyond the bean: coffee, coffee shops and the circular economy’. Circular Economy: Transititioning to Sustainability Conference, Coventry University, Coventry, July 2017. ‘Fostering sustainable business in the coffee shop economy’, British Academy of Management Annual Conference, Warwick University, September 2017. ‘Exploring the new cafe society: spaces of possibility’, Royal Geographical Society Annual Conference, Royal Geographical Society, London, August 2017. Co-working and the cafe'. Workshop on co-working dynamics and the city. CAMEo - Research Institute for Cultural and Media Economies, University of Leicester. March 2017. 'Café culture: new frontiers in the UK’ Aberdeen May Festival, Aberdeen. May 2016. ‘Café Nation? Exploring the growth of the UK café industry’. Centre for Business in Society Seminar Series, Coventry University, Coventry. December 2015. The Economic of International Business: The Coffee and Coffee Shop Industries, Coventry University, February 2018. Slides available on request. The Coffee Shop Industry and Recycling, University of Leiden, Feburary 2018. Slides available on request. What began as a small idea while sitting in a cafe has turned into a number of research projects with mutiple research pathways from cafe business models, cafes as co-working spaces, different cafe cultures, to sustainability in the cafe industry. For me it will always be a good reminder that you should never disregard even the smallest research idea, you never know what it might turn in to.